(1 Gallon) WEEPING WILLOW TREE, drooping branches give the tree a distinctive shape. Great for use as a focal point and in areas that are moist. 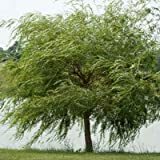 Weeping Willow Tree - 5-6 ft.
Weeping willow tree for sale – Easy plant to grow, edible , mostly grown for the ornamental tree structure and leaves, planting in winter to spring, better to buy plant or another option to start from seeds. Growing information: perennial plant, growing hardiness zone: 4-9, water needed – big amount, light conditions – full sun to partial shade, height: 7-20m, 22-70 feet. Blooming in the summer that appears in yellow color.